I’ve have had my share of problems with my computers over the years. I have had two problems recently. First, a minor one, my Windows 7 desktop would take a long time to shutdown. It turns out it’s because my system was set to delete the memory paging file on shutdown. and then double-click on the entry named ClearPageFileAtShutdown and change it’s value to 0, then reboot the computer. My shutdown time was cut down from about 5 minutes to less than a minute. In the end, I decided to set this back to ‘1’ so that the file will be deleted at shutdown. It’s usually considered a good security practice to have it deleted. As long as I was able to confirm what the problem was. Then I had a more serious problem. My computer was slowing down and the Task Manager indicated that my CPU cycles where spiking at 100% usage but none of the processes showing where using anything even close to that number. Some people might be shouting infection at this point, I was thinking memory leak. I’m not sure if this program is designed to run in the background all the time but it did seem to be in my case. So I killed the process and uninstalled the program. I also decided to replace the Task Manager with Process Explorer. 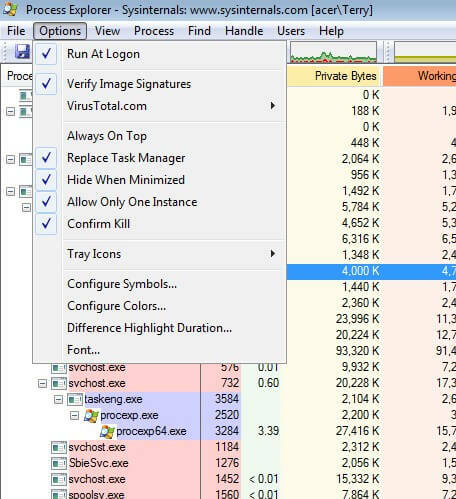 In the program just click on Options and then Replace Task Manager so when you right-click on the taskbar to open Task Manager Process Explorer will open up instead. If you want to monitor CPU usage you can keep this program open in the background by going to Options and clicking on Hide when Minimized – this puts a little animated icon down by your clock when you minimize the program. Putting your mouse over it shows a small pop-up of your CPU usage and whatever program is using it. The link you provide is to Process Monitor. Sorry about that echo, now fixed.